Cordillera - Record-breaking movie by Marvel the "Black Panther has showcased some of the stunning African costumes including Ifugao's indigenous artifacts and Asian themes. 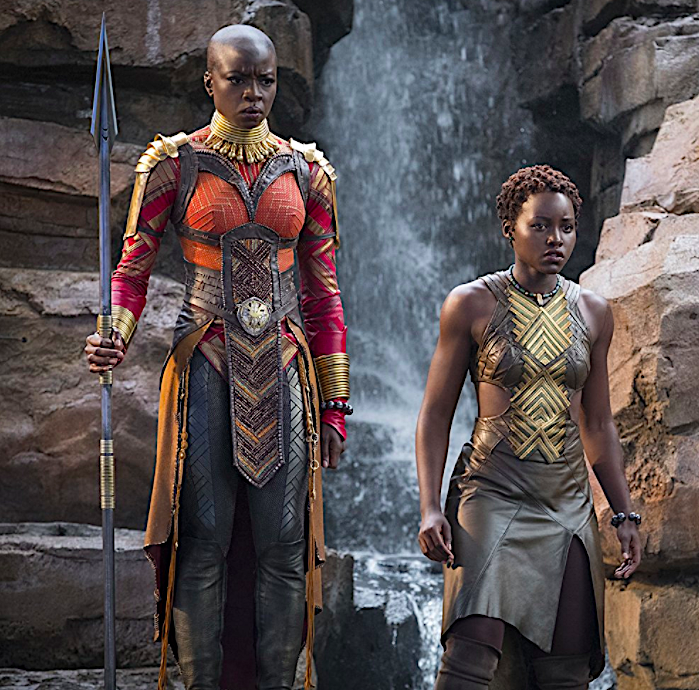 According to Anthony Francisco, a senior visual development illustrator for Marvel, the garb that Dora Milaje (the elite, all-female group of the Wakandan) worn was partially inspired by Filipino tribal artifacts from Ifugao. Francisco who grew up in the Philippines told Buzfeed that he saw African artifacts mixed with tribal Filipino decor in his relatives' homes in Ifugao. 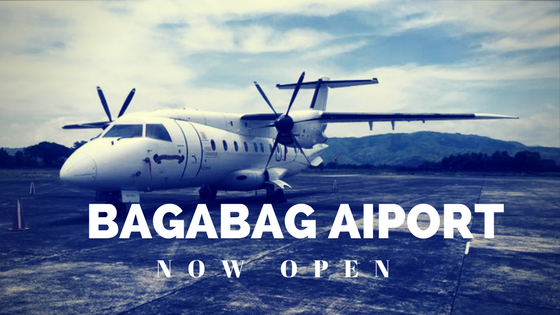 He was inspired specially from the Ifugao tribe who live at the base of the Cordillera Region in the north of Luzon. This tribal inspiration shows up in the costume of Okoye, portrayed by actress Danai Gurira. 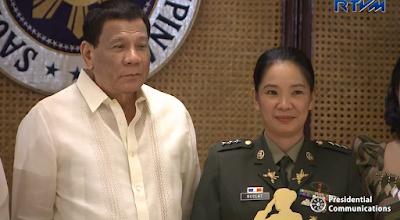 The small golden rings hanging from the tassels at the side of her uniform were amulets, drawn from Filipino superstitious belief. The word Ifugao means "people of the Earth" in English are known for their ancient rice terraces, a UNESCO heritage site built by the ancestors of the tribe in 100 B.C. The Ifugao tribe continues to preserve its rich cultural elements, including weaving, beading and tradition narrative chants. The House committee on health approved a substitute bill requiring government hospitals to provide free dialysis treatment to indigent patients. The bill substituted House Bills 621, 2466, 3924, 4391 and 5503 and HR 244. The bill mandates all government hospitals to establish, operate, and maintain a dialysis service facility in their respective hospitals. It further provides for the establishment of affordable and accessible kidney transplant facilities in strategic areas across the country, as kidney transplantation has been shown to provide the highest quality of life for end-stage renal disease (ESRD) patients. 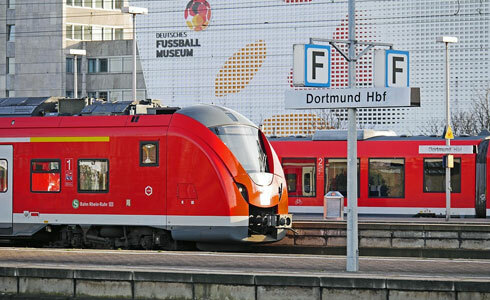 “The measure was crafted to adopt an integrated and comprehensive approach to health developments. Specifically, to improve the delivery of healthcare services to patients with ESRD and encourage them to have a kidney transplant,” said committee chair Rep. Angelina Tan. Moreover, the bill seeks to assist patients who pursue first peritoneal dialysis, and hemodialysis should there be contra-indications. It also provides a screening policy for indigents, and establishes kidney disease prevention activities to benefit ESRD patients and their families. Its provisions qualify an indigent as a patient with no or insufficient source of income or family subsistence, an indigent as identified by the Department of Social Welfare and Development National Household Targeting System-Poverty Reduction (DSWD NHTS-PR), or an indigent but not listed in the NHTS as assessed by a municipal development officer. Moreover, the bill recognizes the “catastrophic” financial drain caused by fighting kidney diseases. The measure includes the expansion of the PhilHealth benefit package for kidney transplantation of renal replacement therapy for both the living and deceased donors. 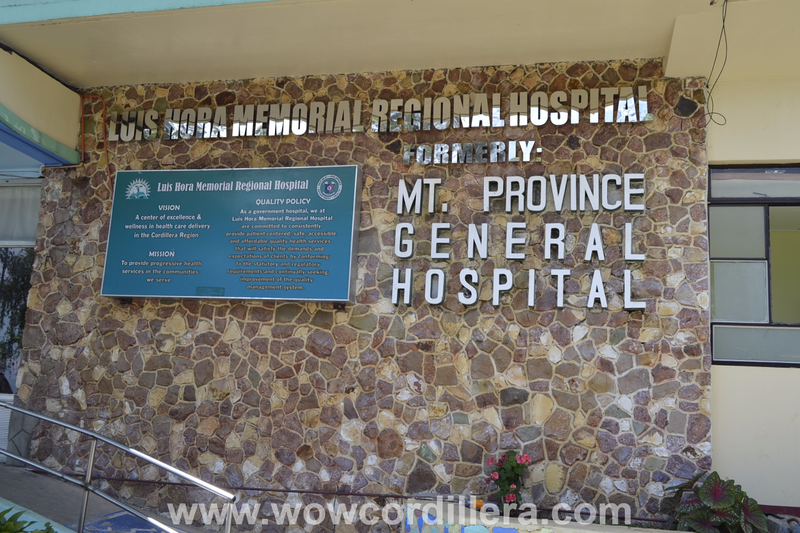 It also expands the PhilHealth coverage for the processes involved in kidney transplantation—from assessment, evaluation, and screening-- to treatment procedures and remedies, and even rehabilitation of donors and recipients. The bill is authored by Reps. Joseph Stephen Paduano, Arthur Yap, Alfredo Vargas III, Tan, Mark Go, and Carlos Isagani Zarate. 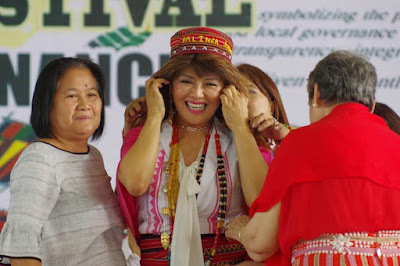 Ilocos Governor Imee Marcos - Adopted Daughter of Kalinga, named "Laggunawa"
Governor Imee Marcos wears traditional Kalinga attire during Kalinga's second Bodong Festival. Photo Courtesy||L Rose Cheo FB Page. Cordillera - Ilocos Norte Governor Imee R. Marcos was honored by the Sangguniang Panlalawigan of Kalinga as a "daugther of the province of the province during the gracing of Kalinga's second Bodong Festival and 23rd founding anniversary. Governor Marcos was given the name "Laggunawa" which means, "a beautiful and strong daughter of a tribal leader". "Sakto yung pangalan ko, anak daw ng chief, kaya I'll have to live up to that name. Sabi nila, This ideal is what you should grow up to, so I must become Laggunawa. I am deeply honored by this endowment and I will treasure this resolution" Marcos said. 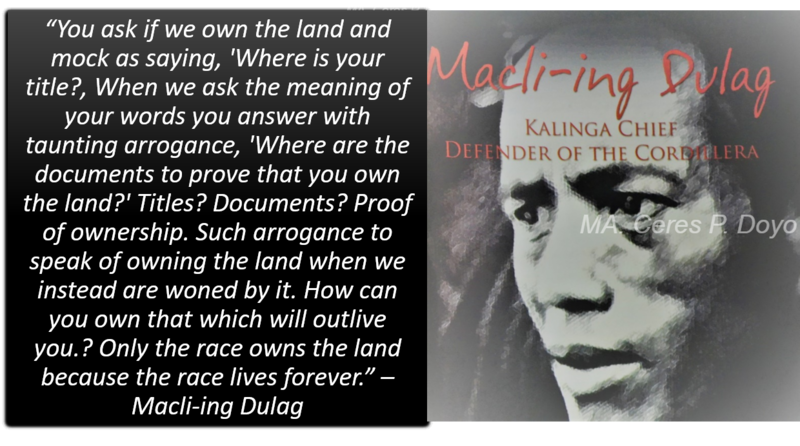 According to provincial tradition of Kalinga, being named a daughter of Kalinga is a customary ethnic practices which is a way of recognizing a person "who have singularly endeared themselves and contributed outstanding services to the people. Sons and daughters of the province are granted certain privileges, including protection under the umbrella of the Kalinga Peace Pact institution of the Bodong Justice System "Pro-Pagta. Governor Marcos also urged the opening of tourism routes from Ilocos Norte to the Cordilleran Region. "Sapagkat ang nakikita lagi ay yung coastal - La Union hanggang Ilocos Norte. There's a very, very rich culture here at kitang-kita na iisa ang ating kultura whether upland, midland, or lowland," Marcos said. She also supports the call for Apo Whang-od, the aging traditional mambabatok (tattooist) of Tinglayan Kalinga to be included as a National Living Treasure. The Technical Education and Skills Development Authority (TESDA) will bring its scholarships closer to those who want to avail of free skills training and even help its graduates in finding a job. This after TESDA Director General Guiling ‘Gene” Mamondiong has stepped up the agency's promotion of the scholarship grants in the provinces, municipalities and districts, when he talked about the two-day National Technical and Vocational Education and Training (TVET) Enrollment and Jobs Bridging which will be held on February 27-28. Mamondiong said that the national TVET enrollment and jobs bridging will be held simultaneously nationwide in local government units (LGUs), sports complex, malls, municipal stadium, and other designated areas. The event aims to reach out to people the various programs of TESDA which they may avail of, he said. “This activity will be conducted in partnership with the Local Government Units (LGUs), Public Employment Service Office (PESO), Regional/Provincial Offices of the Department of Labor and Employment (DOLE), companies/industries, technical-vocational education institutions (TVIs) and other stakeholders,” said Mamondiong. 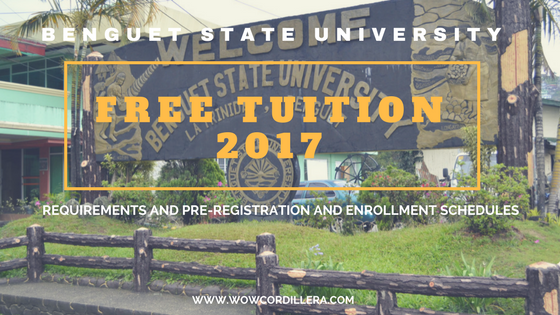 Enrollment is open to all Filipinos age 15 and above for those interested to pursue various technical-vocational (tech-voc) courses. Requirements for the enrollment include valid ID or NSO birth certificate and 1x1 picture. On the other hand, job applicants should bring their TESDA certificate and resume. Mamondiong said the event likewise aims to extend to assistance to TESDA graduates in finding employment. This will serve as "social marketing" and "advocacy mechanism" of TVET and TESDA, he added. Mamondiong said that the TESDA scholarship program is expected to serve as a driving force for change and upliftment of the lives of the of Filipino people who will contribute to the socio-economic development of the country. 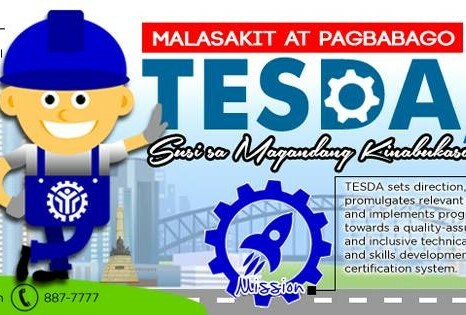 The TESDA chief has also released new rules in awarding scholarship grants under the 2018 Training for Work Scholarship Program (TWSP) and Special Training for Employment Program (STEP), in line with the TESDA Reform and Development Agenda. 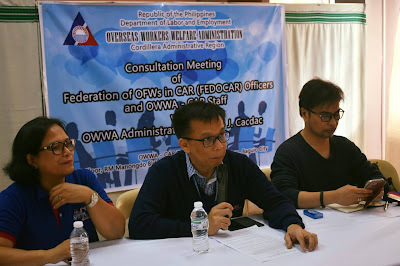 OWWA Administrator Han Cacdac talks during a consultation meeting of Federation of OFWs in CAR. Photo Courtesy: OWWA Baguio. 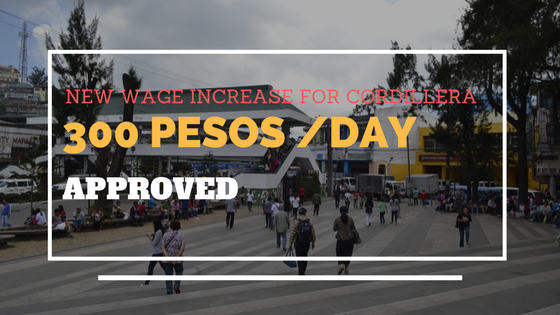 Cordillera - Overseas Filipino Workers (OFWs) in Cordillera will soon experience better services from the Overseas Welfare Administration (OWWA) after a memorandum of agreement (MOA) was signed on Monday by both Baguio City/Benguet province officials and OWWA officials. No less than OWWA Administrator Hans Cacdac and Baguio City Mayor Mauricio Domogan lead the signing at the Baguio Country Club together with Local Government officials of Baguio and Benguet. The MOA aims to help OFWs and their families to have an easy access to government services when they need. Part of the MOA is the creation of a help desk that will serve as link to other agencies of the government like the Philippine Overseas Employment Administration (POEA) and the Department of Labor and Employment (DOLE). Cacdac explained that the help desk will also serve as a venue for OFWs and their families to get help and immediate assistance in the different localities. He also mentioned the OF bank that was just launched on Jan. 18, a campaign promise of the president to aid OFWs who needs financial assistance like loans and livelihood funding. OFWs can take advantage of the non-collateral loans of up to Php350,000 at only 6% annual interest rate and OFWs can borrow capital to start a business of other projects. Just like any other banks, the OF bank provides competitive deposit products such as Peso ATM Savings, time deposit and checking accounts. It also include a special Savings Plans designed for OFWs to encourage and inspire them to develop the habit of saving money. Soon the bank will be used by OFWs as a center to remit money at the cheapest, fastest, secure, and convenient mobile credit-to-account-system that is better than other remittance centers in the country. Baguio City - Speaking before thousands of Baguioans at the newly refurbished Baguio Athletic Bowl on Thursday (February 1), presidential spokesperson Harry Roque said he is a 'proud Cordilleran' and revealed the near completion of his first residential house somewhere in Baguio, according to Philippine News Agency. The 23rd year celebration of Baguio's Panagbenga Festival formally opened Thursday morning with a parade that started from upper Session Road down to Magsaysay Avenue going to Harrison Road then to the Athletic Bowl. 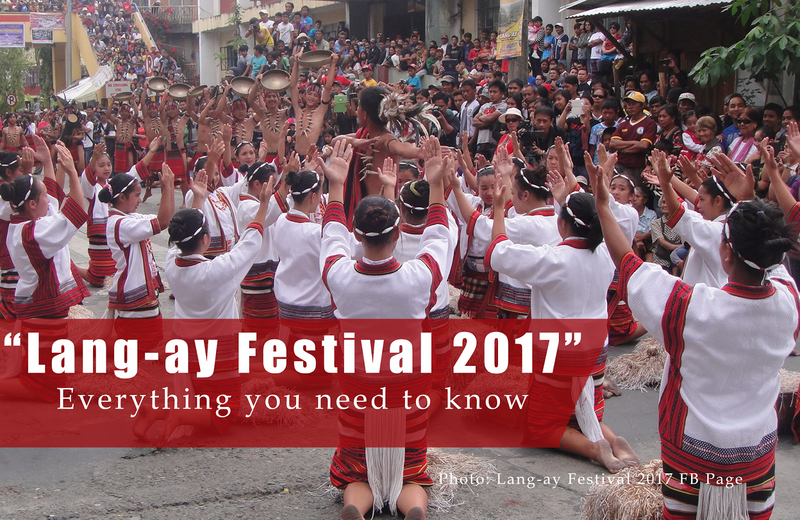 The Panagbenga Festival highlights the deep cultural roots and creativity of the people of Baguio and nearby provinces of Cordillera. 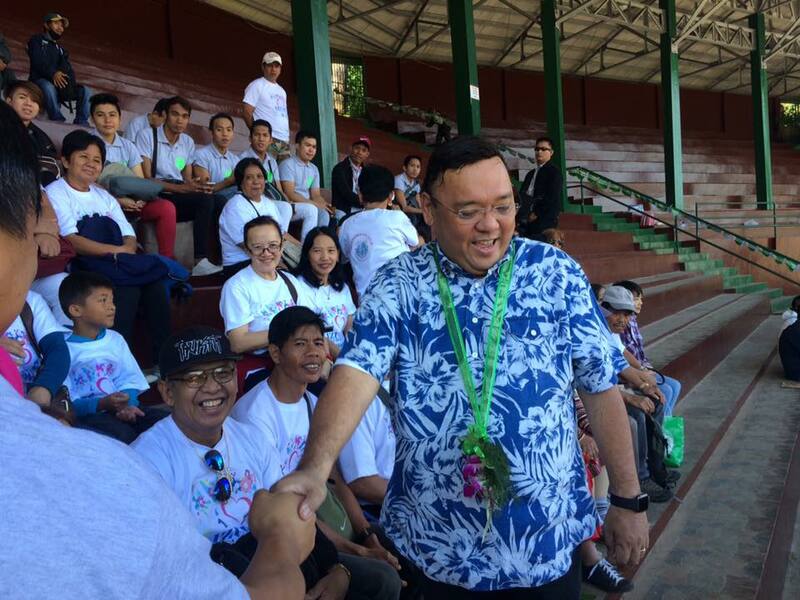 Roque was the guest speaker during opening ceremony of the festival at the Baguio Athletic Bowl. He also held a 30-minute press briefing where he told the media that he will try to convince the president to be the guest speaker during Panagbenga's grand street dancing parade on February 24. "I will convince (President Rodrigo Duterte) to attend the highlights of the celebration. Talagang kukumbinsihin ko siya na umakyat." Roque said in an statement before thousands of Panagbenga opening revelers. The city government of Baguio had sent an invitation to Malacanang inviting President Duterte to be the guest speaker during the program of the grand street dancing parade on the 24th February. Baguio residents are expecting Duterte to heed to the invitation. "Asahan niyo po na kukulitin ko siya, para makabalik ako ng Baguio. Sa ngayon wala pa sa schedule," Presidential Spokesperson Roque reiterated during the press briefing.